A few months ago I started wearing a heart rate monitor for most of my runs and bike rides. It’s been super interesting. I didn’t know much about heart rate training but when I did spin instructor training earlier in the summer we had to use one for the training. And I was hooked. I’ve read really basic things about what zones you should do different kinds of workouts in. There are training programs that are almost entirely based on heart rate zone. I’m still getting used to it and figuring things out but I think I may use one next spring/summer when I’m training for the Summer of Triathlon (my new name for summer 2015). 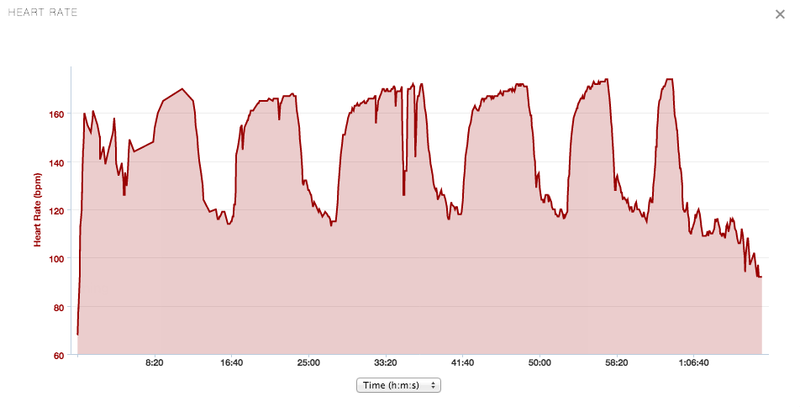 Here’s a picture of my heart rate from a recent speed workout. I could just look at these all day. It’s so cool to see my heart’s response to what I’m doing. I’m excited to see if/how it changes over the course of a training period. The cool thing about Garmin Connect is that it’s really easy to compare runs so I can click on all of my 7 mile runs for example. I think in a few months it will be interesting to see if my ave pace, heart rate, etc. are different than they are now. If you’re interested, I read an interesting piece on Runner’s World recently about training with a heart rate monitor.